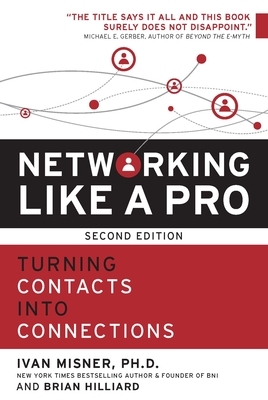 Networking master and New York Times bestselling author Dr. Ivan Misner along with David Alexander, and Brian Hilliard teach entrepreneurs how to master the art of networking. Introducing an exclusive results-measuring system; the Network Scorecard; this powerful guide motivates entrepreneurs to reach quality prospects, leverage new and current contacts, prompt ongoing referrals and ultimately, boost their client base and their bottom line. With this powerful guide, eager entrepreneurs uncover undeniably effective networking techniques for building, reviving, and growing their business. Following the action plans provided, entrepreneurs learn key networking strategies including how to build their social capital, farm (not hunt) relationships and referrals, leverage the four major; of their networking driver, track the results of their efforts, and more. Entrepreneurs also discover how to enhance their networking efforts with new media tools, helping them reach new levels of referrals, free promotion, and connection with their clients. Dr. Ivan Misner is the Founder and Chief Visionary Officer of BNI, the world's largest business networking organization. BNI was founded in 1985. The organization now has over 7,000 chapters throughout every populated continent of the world. In 2015, BNI Members generated more than $9.3 billion in closed business. Dr. Misner's Ph.D. is from the University of Southern California. He is a New York Times Bestselling author who has written 21 books including his latest release, "Who's In Your Room?" He is a columnist for Entrepreneur.com and has taught business management at several universities throughout the United States. In addition, he is the Senior Partner for the Referral Institute - a referral training company with trainers around the world. Called the "Father of Modern Networking" by CNN and one of the "Top Networking Experts to Watch" by Forbes, Dr. Misner is considered to be one of the world's leading experts on business networking and has been a keynote speaker for major corporations and associations throughout the world. He has been featured in the L.A. Times, Wall Street Journal, and New York. Times, as well as numerous TV and radio shows including MSNBC, CNN, the BBC and The Today Show on NBC.